New! 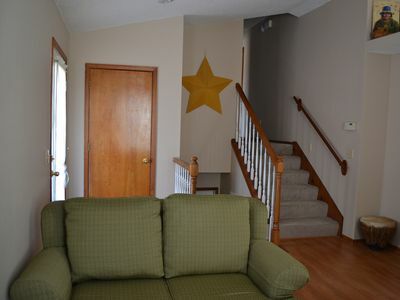 Cozy 3BR Fayetteville House w/Fenced-In Yard! 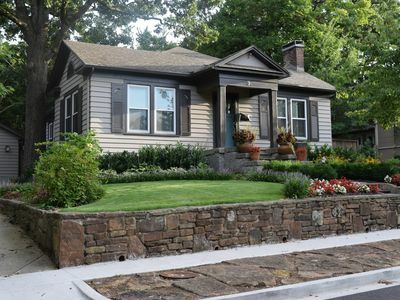 Seven guests visiting the University of Arkansas will adore this 3-bedroom, 2-bathroom vacation rental house in Fayetteville. 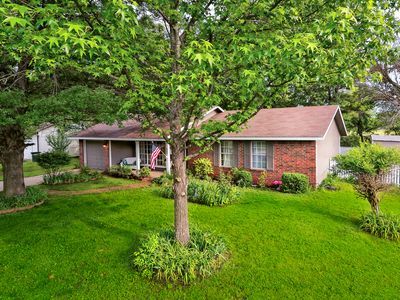 The cozy home is perfect for Razorback fans who want to be close to all of the action on campus and also desire some peace and quiet in a family-friendly neighborhood. 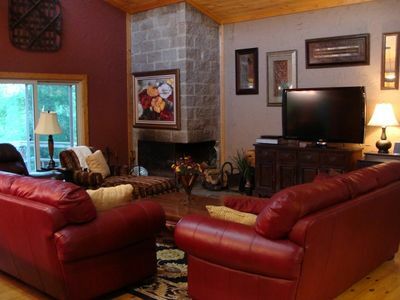 After a fun day in Arkansas, everyone in your group will enjoy spending time on the back patio, cooking delicious food on the charcoal grill, and listening to the babbling brook that runs behind the house. The cathedral ceilings, hardwood floors, and open floor plan of this cozy home give it an airy feeling, and the large windows allow for plenty of sunlight to enter the home - adding to the airy ambiance. 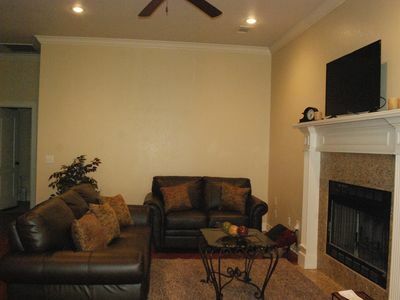 Watch your favorite shows on the flat-screen cable TV while you lounge on the comfortable couch or plush arm chairs. Step outside to the front porch or back patio, which are both perfect for enjoying your morning coffee in the clean Arkansas air. 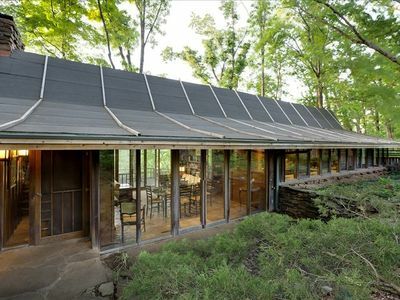 The back patio is also great for grilling out and spending time by the fire pit once the sun goes down. 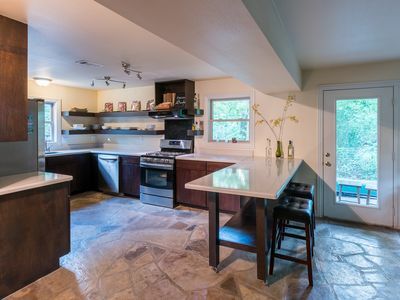 If you’re not in the mood for grilling out, the large kitchen is perfect for making any meal. There’s a dining area adjacent to the kitchen with seating for four. After a long day, rest your head on one of the cloud-like beds. 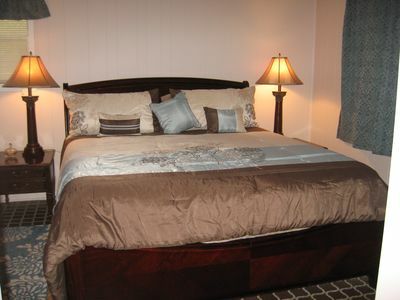 The master bedroom and second bedrooms both feature queen-sized beds and the third bedroom has a futon. There is also a queen-sized pullout bed in the living room for additional sleeping accommodations. You really can’t get closer to campus without getting caught up in all college craziness. 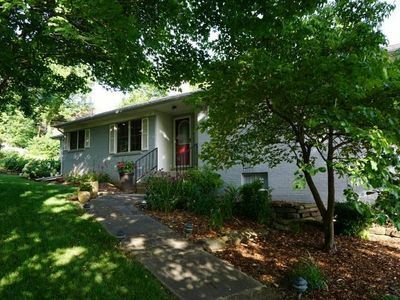 The house is just a quick 2-mile drive away from the football, basketball, and baseball stadiums. Go for a stroll down by the campus and check out all of the great restaurants. With so many options, there’s a restaurant to satisfy everyone’s appetite! There’s a new bike path only one block away from the house. The path is lit up at night, perfect for day and night use! There are several museums and historical sites in Fayetteville and surrounding areas that may interest the Civil War buffs in your group. 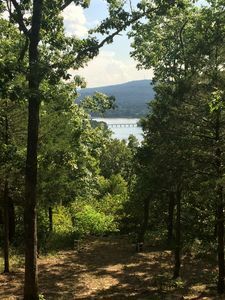 Great hiking and fishing opportunities can be found in the Ozark National Forest, which is only about 40 minutes south of Fayetteville. 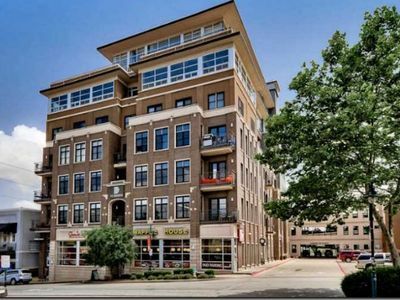 - Amenities include a fully equipped kitchen, charcoal grill, fire pit, air conditioning, ceiling fans, flat-screen cable TV, wireless internet access, in-unit laundry machines, parking, and much more! 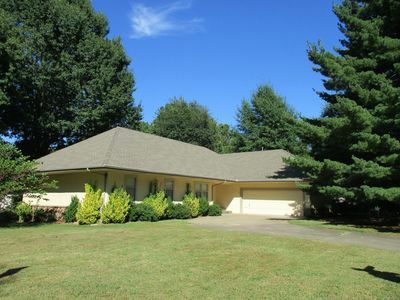 - Fantastic location just two miles away from all of the excitement at the University of Arkansas. There are hiking and biking opportunities nearby, as well as several interesting American history sites. Perfect for wedding groups/large groups. Pricing explained in 1st paragraph. Serenity With Beautiful Views, and All The Comforts Of Home. Holiday specials!